The State Innovation Model fueled change to transform health care in our state. From 2015 to January of 2019, Delaware received $35 million in federal grant funding under the State Innovation Model (SIM) program. During those four years, stakeholders from hospitals and health systems, insurance companies, physician practices, and community organizations worked together to improve health care access, quality, and affordability. There were many accomplishments. Key among them were the establishment of health care spending and quality benchmarks, implementation of value-based payment programs, health care practice transformation to improve overall performance, workforce initiatives to bring more talent to our state, and the integration of behavioral health into practice workflow. Agenda: Emerging answers; Delivery system; Population health; Payment model; Potential organizing models and discussion; Update for other workstreams. This document is Delaware’s State Health Care Innovation plan, which has been developed with support from the State Innovation Models initiative. A summary of the consensus of local stakeholders, as adopted by the Delaware Center for Health Innovation Board of Directors. These strategies and all relevant risk factors should be revisited regularly to ensure that the plan remains up-to-date and accurate. As such, strategies may be re-prioritized over time. To facilitate logical re-prioritization and ensure appropriate sequencing of activities, awardees can include any activities upon which strategies are contingent or necessary precursors as well as relevant timeline, lead entity, and relevant workgroups that should be involved. The Delaware Center for Health Innovation's Payment Model Monitoring Committee Charter, which details the committee's goals and area's of focus. 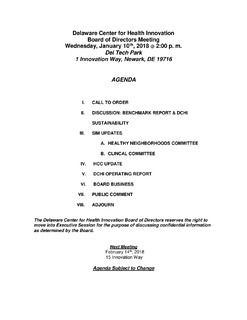 The Delaware Center for Health Innovation's Clinical Committee Charter, which details the committee's goals and area's of focus. The purpose of this report is to summarize the activities and results of the state-led evaluation of the first-year implementation (AY2) for the Delaware State Innovation Model (DE SIM). 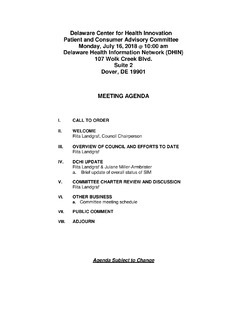 The Delaware Center for Health Innovation's Patient Consumer Advisory Committee Charter, which details the committee's goals and area's of focus. An elaboration on their perspective on outcomes based payment for primary care providers or for larger systems or networks assuming accountability for the health and health care of a population. The Delaware Center for Health Innovation's Workforce and Education Committee Charter, which details the committee's goals and area's of focus. The goal for this paper is for the DCHI Board to adopt this paper as a consensus stakeholder view and position on the strategy for behavioral health. This paper describes DCHI’s proposed framework for scaling Healthy Neighborhoods Communities across the state of Delaware. The goal of this paper is to recommend the development of a framework for sustainable workforce capacity assessments that will aid in the projection of what workforce will be needed to deliver care in the future. The HMA developed this overview of the Delaware HCC Behavioral Health Integration Pilot Program.